Do you ever start a project knowing that there’s a fairly good chance it’ll end up a flop, but you go ahead and do it anyway? That was this project. 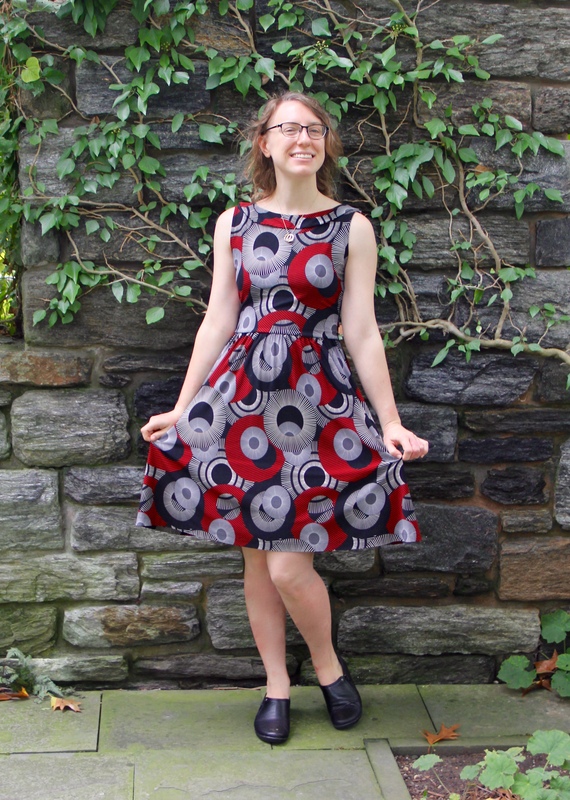 I generally shy away from shift-dress-type garments because they tend to look very sack-like on me, but when I saw the Colette Mesa pattern in the June issue of Seamwork, curiosity got the better of me and I had to give it a try. That and a fabulous knit remnant find from Britex. So I dove in, knowing full well that this could end up in the UFO pile. After briefly studying the finished measurements for the pattern, I saw that the dress was meant to have negative ease through the hips, which is pretty much my mortal enemy. So I simply graded from an XS at the bust all the way out to a size large at the waist/hips area, since I knew I would rather have extra fabric there than fabric clinging to my tummy/bum. When I tried on the finished garment, I was a little horrified with its sack-like-ness, but with the easy addition of a skinny belt, I decided it could stay. And, to my surprise, I keep finding myself reaching for it on days when I want to feel polished yet comfortable. Which is most days. So I wear it a lot! 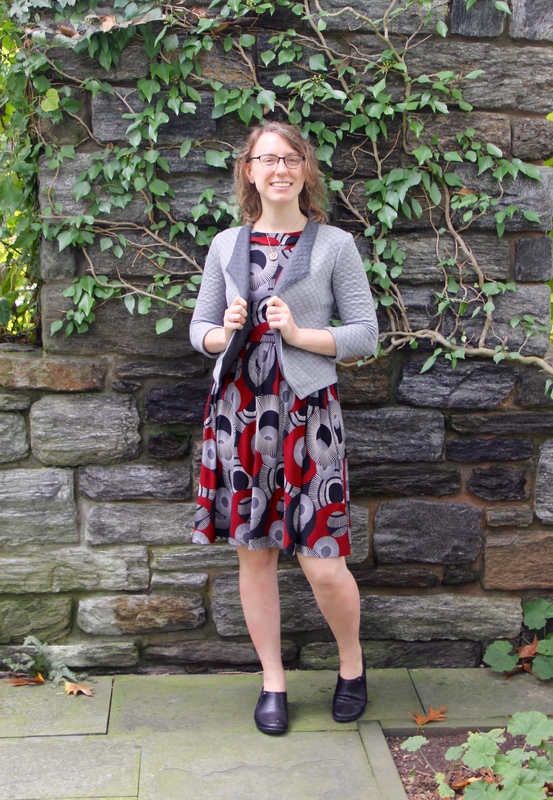 And as it turns out, the dress pairs perfectly with the Morris Blazer from my last post, so I usually pair the two together for an especially put-together look. Oh, and in case you’re wondering what the heck is up with the dress sleeves, the sleeves accidentally got rolled up when I wore the jacket out to do my photo shoot, and I didn’t notice it until I was reviewing the photos later. Oops! Annoying, but I decided I was too lazy to try and retake all those pictures :P.
So there you have it – a simple, classy ensemble that I go to again and again! Today I have not one, not two, but three unblogged garments to share with you! My pile of “needs to be photographed and blogged” pieces is really building up, so I have a lot of catching up to do – not that I’m complaining! 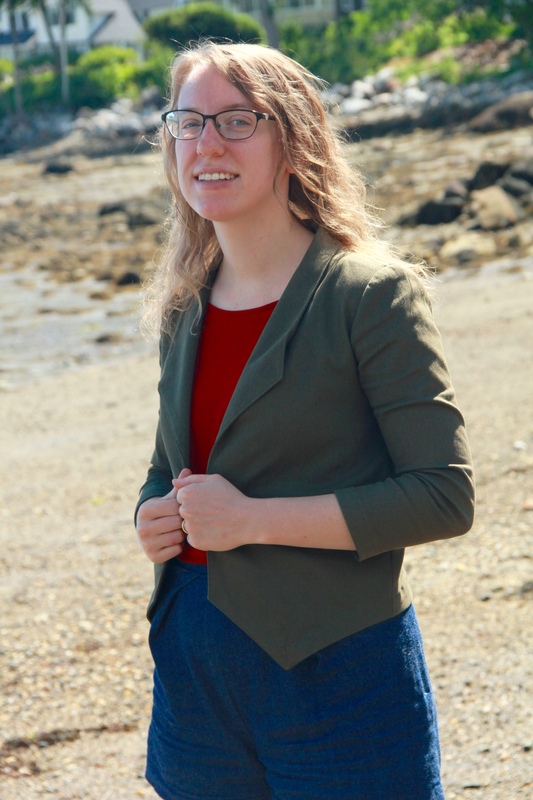 Since we were renting a cabin in Maine with my parents over vacation, I wanted to make sure I took advantage of my dad’s superior photography skills and camera, and on our last day there we did a lovely little shoot at the beach right across the street from our rental. The view you see here – that’s what we saw when we looked out the window! It doesn’t get any better than that. Next up I have the Aurora tank from the June issue of Colette’s Seamwork Magazine. I really enjoyed both of the patterns in this issue, and have made up the Mesa as well, but just haven’t blogged it yet…story of my life! The fabric for this make is a Brazil knit made by Telio, which I purchased at Eddie’s Quilting Bee in Sunnyvale. I had never heard of Brazil knit before I encountered this fabric, but it kind of looks like a tiny herring bone pattern on the right side and a “normal” knit on the wrong side. It has a lovely, heavy drape and very strong recovery, making it nice for flowy dresses and tops. As you can see from these pics, the armholes are a bit too tight due to the method I used for finished the under arm raw edge. The pattern has you simply turn under the raw edge like a hem, but the curve on the pattern pieces is very deep, and the strong recovery of the fabric meant that it simply refused to press such a tight curve. I ended up having to use a knit binding, which I think I must have stretched too much while applying, hence the puckers at the armholes. Oh well – it was a good learning experience! I especially like the back pleat detail – it gives a little more room for my wide shoulders. I may try going a size up next time to see if that helps with the armhole situation. We’ll see! And what’s the third garment, you ask? My Katy and Laney Tap Shorts! 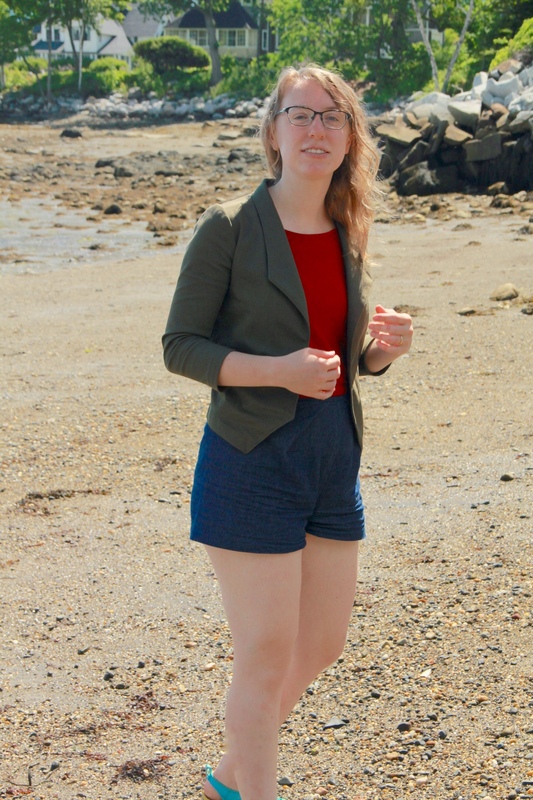 I made them last summer after the pattern came out, and was so happy to have weather hot enough that I could finally wear them again! Clearly, they really need to be ironed since their last wash, but they’ve been getting a lot of use and turned into a real workhorse during this vacation. And so ends my summer vacation. I’m definitely feeling sad not to be on the east coast anymore, but this trip was a nice contrast to my west coast life, helping me see the pros and cons of both locations. I have a feeling the east coast will always feel like “home” to me, but I look forward to the new adventures the west coast has in store for my this fall!